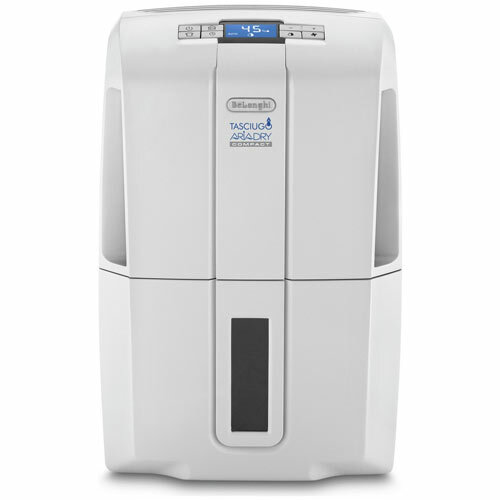 The Delonghi DDS25 is great at removing water at room temperature and above. While it's not the best for cooler conditions, it's an excellent dehumidifier that can rapidly reduce humidity. The Delonghi AriaDry DDS25 is a refrigerant dehumidifier with a huge 25 litres/day extraction capacity. While it’s relatively unknown in the UK, the DDS25 is a popular model around the world, mainly due to its ability to extract large amounts of water quickly and the additional air filtration function. In this review, we’re going to find out whether this is a model that can handle the average UK home. We’re also going to take a closer look at its portability, power consumption and various other features to see whether it’s a dehumidifier you should consider buying. 4.1 Where to Buy The DDS25? 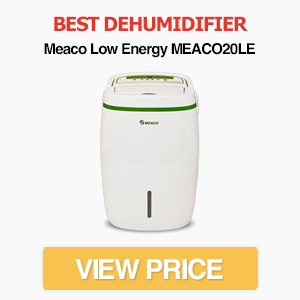 4.2 What Are Some Other Great Dehumidifiers? At first glance, the DDS25 has a bulky appearance. It can’t match the sleek design of other models on the market, and we prefer the exterior of the company’s DNC65 model. With that said, it’s not an ugly dehumidifier. The blue control panel provides a modern style, while the side slots look less “messy” than the rotating louvres found on many dehumidifiers. The vent at the back of the machine is less obvious than those found on competing models. An interesting feature of the DDS25 is its air filtration function. The machine includes an anti-bacterial filter, which helps remove unwanted bacteria from the air. This function cannot be used at the same time as dehumidifying though. It also comes with all the standard features you would expect from a modern dehumidifier. These include an anti-freeze setting, auto shut-off when the tank is full and a continuous drainage option. There’s no integrated cord storage though. The DDS25 has a 4.5 litre water tank capacity. This is relatively large, as most refrigerant models (see here for more examples) have a 2-3 litre tank. In fact, the only model we’ve reviewed with a larger tank is the Meaco Low Energy. This large tank is important, as the DDS25 can quickly remove water from the air (more on that in a minute). It also has a front loading design and visible water levels, which makes it easier to empty. 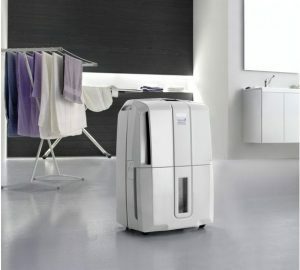 Delonghi refers to the DDS25 as a compact dehumidifier, so you wouldn’t expect it to be a bulky machine. Its size is around average for a refrigerant model, with a 34.6cm width and 48.8cm height. It’s deeper than many dehumidifiers though, at 27.8cm, so we don’t entirely agree with the “compact” label. Something to note about the DDS25 is that it’s very heavy for a dehumidifier. At 15kg, it’s the heaviest we’ve reviewed so far. This is partly to be expected, due to its high extraction rate, but if you’re going to be carrying a dehumidifier a lot it’s probably not the best option. It does come with caster wheels and a handle though. The most important feature of any dehumidifier is its ability to extract water from the air – and the Delonghi does a great job in this regard. You won’t get close to the huge 25 litres/day extraction rate unless the conditions are warm and humid, but it’s capable of removing water quickly in the average UK home. 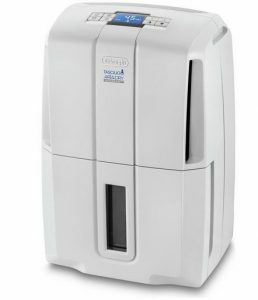 At room temperature, this is an excellent dehumidifier that will rapidly reduce humidity. That doesn’t mean it’s useless in cooler conditions though. While a desiccant machine is always going to be more effective at lower temperatures, the DDS25 can still remove a reasonable amount of water. It can even operate down to a temperature of two degrees Celsius, although at this temperature it probably isn’t doing much good. A downside to this powerful extraction is that it’s a relatively noisy machine. On its lowest fan setting, the model has a noise output is 45dB, but this rises to 50dB on the highest setting. While this isn’t unacceptably loud, it’s probably too noisy to watch TV without it being a distraction. Delonghi has also included a double-condense elimination system. In theory, this means the water falls more efficiently into the tank, although you probably won’t notice much difference compared to other dehumidifiers. There are three fan speeds: Min, Med and Max. You can also choose the auto-fan function. The fan speeds are great if you want to reduce the noise of the machine, although the minimum is 45dB which is still noticeably louder than some dehumidifiers. There’s an on/off timer that can be set up to 24 hours in advance, which is useful if you don’t want the machine running all day when you’re out. The Delonghi DDS25 has a massive extraction rate of 25 litres per day, so it’s suitable for homes with 3-5 bedrooms. The relatively big 4.5 litre water tank also means you won’t need to empty it as often. The Delonghi DDS25 consumes 410W. This is higher than the 255W consumed by the Meaco Low Energy 20L, which is a similar model, although the Delonghi has a higher maximum capacity. To put this in perspective, assuming an energy cost of 15.32p/kWh, the Delonghi costs a maximum of 6.28p/hour compared to 3.88p/hour for the Meaco Low Energy. This might be an unfair comparison though, as the Delonghi has a higher maximum extraction rate. So, while it’s not the most energy efficient on the market, it’s not too expensive to run either. One of the best features of the DDS25 is its control panel. The sleek touch buttons and digital display make it easy to setup the dehumidifier how you want, while also providing a modern style that’s missing from machines with analogue panels. On/Stand-By – Nothing special here! This button is for switching between “On” and “Standby” modes. Thermometer/Hygrometer – When you press this button, the digital display briefly shows the humidity and temperature in the room. Laundry – This button switches on the laundry mode. Timer – The clock button allows you to set a timer for either when the machine switches on or off. Dehumidifying – The button with two drops controls the dehumidifying mode. You can use it to cycle between Min, Med, Max and Auto modes. Fan – There are three fan settings: Min, Med and Max. The fan button cycles between all three. + and – buttons. These buttons allow you to set the target humidity in the room. You can adjust the target in 5% steps. These buttons are also used for setting the timer. There are a few issues with how the Delonghi runs though. The automatic mode is designed to reduce humidity to your target levels, but it isn’t always accurate. The filter can also be a hassle to change, although you won’t need to do this regularly. The Delonghi Tasciugo AriaDry DDS25 is one of the most expensive dehumidifiers on the market. If you’re looking for a cheap model, this isn’t the one to go for. Does it provide value for money though? If you’re looking for a powerful model that excels in room temperature conditions, it’s a great choice. 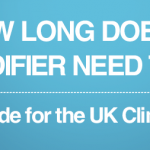 The fast extraction speeds and useful settings make it one of the most effective dehumidifiers for the average UK home. It’s probably not the right choice for garages or boats though, as desiccant models are better for cool temperatures. Where to Buy The DDS25? The DDS25 isn’t widely available in the UK. While you can find it on Argos and Amazon, most other shops don’t sell it at the moment. If this changes in the future we’ll update this review. If you’re looking for the manual or instructions, check out this PDF. 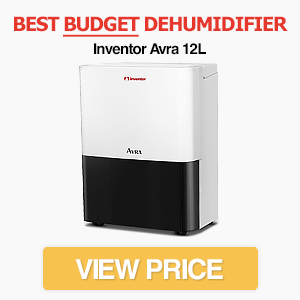 What Are Some Other Great Dehumidifiers? 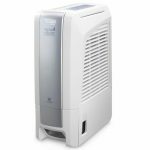 The Delonghi AriaDry DDS25 is an excellent dehumidifier. It’s not cheap, but it’s great at removing moisture from the air at room temperature. It also has useful features like a 24 hour timer, auto-humidity mode and a visible water tank. There are some drawbacks though. It’s a heavy machine, so it’s not the most portable. It’s also not as effective in cooler temperatures as a desiccant dehumidifier, but this is the same for all refrigerant models. Delonghi DNC65 Dehumidifier Review - Does The Tasciugo Ariadry Light Live Up to Expectations?